Imagine a fantastical realm full of magic, adventure and peril. Now imagine four drag queens have been dropped into the middle of it to sashay through a fantasy adventure. That’s the concept behind Queens of Adventure, a new podcast that combines over-the-top drag performances and epic role-playing games. 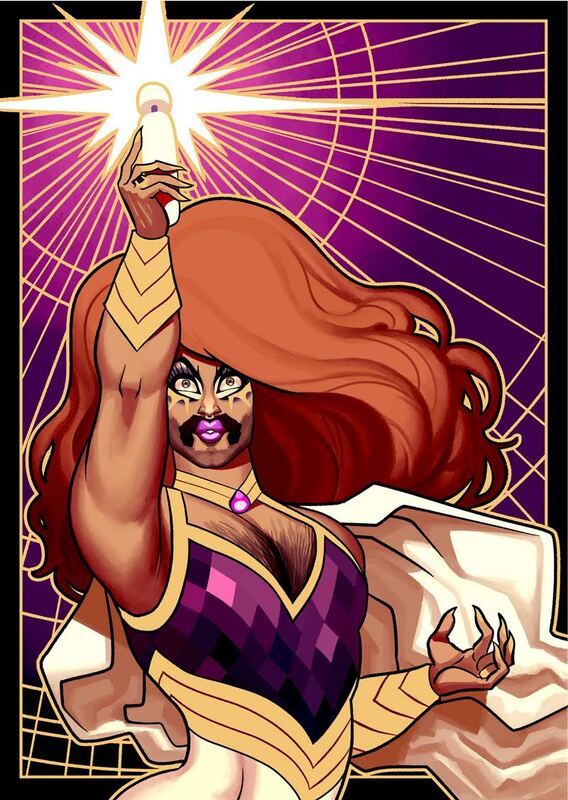 Currently crowdfunding, the show stars real drag queens playing a game of Dungeons & Dragons, on an ongoing quest through an enchanted — and very queer — realm. I’m the Dungeon Master of the game, which means I guide the queens on their adventure. I’m also the co-creator of the show, along with my partner James, who has worked in game development for years. 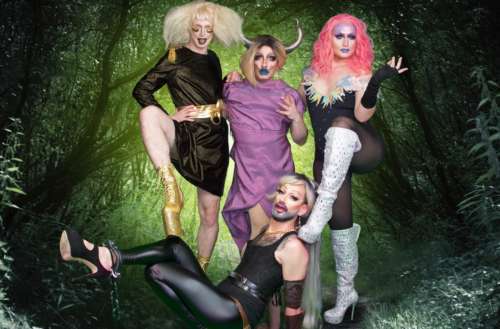 Queens of Adventure began as a live show in Seattle starring local queens Harlotte O’Scara, Butylene O’Kipple, Fraya Love and Arson Nicki. They’ve been playing regular Dungeons & Dragons adventures for sold-out crowds at our live shows for months. Now we’re creating a podcast so the queens can go on longer adventures, and so people can listen all over the world. To bring Queens of Adventure to life as a podcast, we created a Kickstarter to pay for the performers, music, art and equipment. We believe strongly in the importance of paying queer creators, and the bulk of the funding will go to the queens themselves to ensure they don’t die of exposure.Why combine drag and Dungeons & Dragons? At first it might seem like the two have absolutely nothing in common, but in fact they’re a perfect match. Both drag and D&D are about creating characters that represent a fierce and fearless alter-ego within. Drag artists inhabit elaborate personas, delving deep to unleash a fabulous performer ready to slay a lip sync. Dungeons & Dragons players do exactly the same, crafting a deeply personal role in which they can slay dragons.“Putting on drag is like putting on armor,” says Harlotte O’Scara, the show’s rogue. As a kid, Harlotte taught herself to draw elaborate costumes for her fellow D&D players. That skill helped her become a costume designer as an adult, turning her fantasy sketches into the drag outfits that she creates for herself and other queens. Drag queens are daring, creative, unpredictable and bold — all the qualities that make for an outstanding hero. Not only that, but both drag and D&D culture emerges from local experiences. Whether they’re players, performers or audience members, participants interact face-to-face around a table or around a stage. The two also have their own specialized references and language, from draggy jokes about tucks and wigs to tossing out role-playing spells known as cantrips. “You’re cantrippin’, girl,” Butylene jokes at Harlotte during one show, blending slangs. “It’s been really fun to take both sets of referential cultures and put them together,” Arson says. The Queens of Adventure Kickstarter hit its first goal in its first five days and is now reaching for stretch goals. 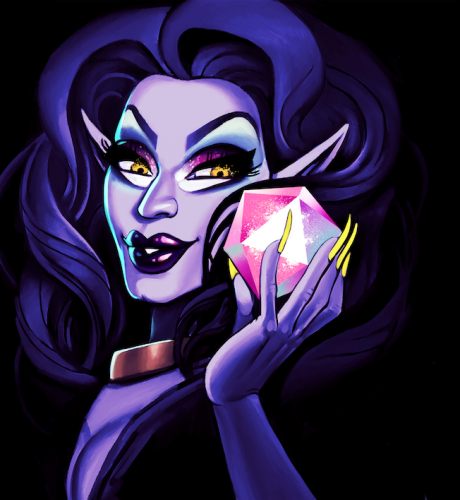 Those goals include livestreaming games with the queens and releasing a fully illustrated drag-themed adventure that anyone can play. The podcast will launch in May of 2018, with most backer rewards shipping at the same time. Backers can sign up for perks like getting to name game elements, receiving a beautiful foil-printed postcard in the mail, and voting on game elements to affect what happens on the show. The live shows have been great queer fun, and now our hope is that the podcast can inspire and entertain listeners all over the world, reminding them that they’re part of a great big powerful band of LGBTQ heroes.